The state is border by four Great Lakes, making it an important center of transportation for people and commerce. Indian tribes were attracted to the region. The Ottawa, the largest being the Chippewa tribe and the Potawatomi people were three of several Native Indians to the Michigan region. France had the first Europeans in the area with Etienne Brulé in 1618. Other Frenchmen who followed included Jacques Marquette, Louis Jolliet and Robert Cavelier La Salle. It was Jacques Marquette who established a Jesuit mission at Sault Sainte Marie in 1668. In 1701, Detroit was founded by Antoine Laumet de La Mothe, sieur de Cadillac, a French army officer. The French trading settlements, known as part of the Province of New France, expanded and remained in place until they lost the French and Indian War to England. Great Britain had full control of the Michigan region by 1763. During the American Revolutionary War of the 1770s, Detroit was an important British supply center. French-Canadians and Native Indians made up most of the residents. After the war, England still held control of the area until 1794 when they signed it over to the Americans. That changed in 1812, when the Michigan territory was captured by the British. The United States pushed the British out by 1813. Once the Erie Canal opened up in New York in 1825 this brought a large influx of settlers to Michigan. New commodities such as grain, lumber, and iron ore could be shipped via the Great Lakes through the Erie Canal to this new frontier. Michigan had 80,000 residents by the 1830s. More than enough to apply and qualify for statehood. Michigan entered the Union as the 26th state on January 26, 1837. The 1830s though the 1860s had seen many Dutch immigrates settle in Michigan as well as huge numbers of Germans making this an important note for Michigan genealogy. The new immigrates were interested in the rich farmlands. During the American Civil War of the 1860s, Michigan supported the Union and had many regiments in countless battles. From 1890 into the early 1900s, Michigan became the center of automobile production with Ford, General Motors and Chrysler companies. This new and fast developing industry attracted thousands of workers from other states and other nations. The state produces important amounts of iron, copper, iodine, gypsum, bromine, salt, lime, gravel, and cement. The agricultural fields grow apples, cherries, beans, pears, grapes, potatoes, and sugar beets. Michigan’s forests contribute significantly to the state’s economy, supporting thousands of jobs in the wood-product, tourism, and recreation industries. Other industries along manufacturing and processing lines, include prepared cereals, machine tools, airplane parts, refrigerators, hardware and furniture. 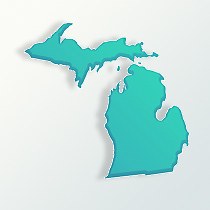 In studying Michigan genealogy, the ethnic background of most citizens of Michigan is that of German, followed by the Dutch in the western section of the state. The greatest concentration of African-Americans and those from Poland are in the Detroit area. A large cluster of Scandinavian people live in the Upper Peninsular section. The Hispanic population is only 3.5 percent of the total state and the Asian segment is only 2.5 percent. The population for Michigan in 1820 was about 7,400 people. It very quickly increased to 212,300 by 1840. More than a million people lived in Michigan by 1870 and over 5 million by 1940. Michigan’s total population in 2009 was about 10 million.